With the weather being a factor at these last few races the fields have been reluctant to race with the heat reading at nearly 100 degrees or above as it was the day before at the Majestic Cycling Crit in San Bernardino. The Pro 1/2 field had approximately 30 plus guys and some of the Teams had two or three riders per each team. The challenging Jurupa Valley Grand Prix course and the heat of the day we’re going to make this a hard race. The race started out fast with Jason Cianfrocca (SoCalCycling.com Team) making the first move of the day with a solo attack. This move drew out the soon to be players for the day’s race. They started out fast and allowed for a break to get started with three groups coming together to form a group of eight. The group got organized and continue to hold about a twenty plus second gap for about five laps. Once they were all settled in, the break started to increase its lead on the remaining field and the gap reached the one minute plus gap with two riders getting dropped to make a a break of six riders that included Tyler Locke (Centric Bikes), Wesley Eslick (SoCalCycling.com Team), Leo Bugtai (Tru Cycling), Jason Cianfrocca (SoCalCycling.com Team), Nate Freed (Herbalife pb Marc Pro) and Francisco Javier (S2C / Primal). Near the end of the race, attacks from the breakaway started to take place to lap the remainder of the field. Both Leo Bugtai (Tru Cycling) and Tyler Locke (Centric Bikes) started to throw in some solid attacks, but they didn’t really get much of a gap as there were two SoCalCycling.com Team riders that covered the attacks. With the race being so hot, Jim Allan had a sprayer that he brought out for the day to hose down the riders with. This was a lifesaver for some of the riders that needed to keep cool! As the race got within the closing laps, the remaining field got lapped and this could have made for a confusing race. However, the break went right through the field. As the bell lap rung, the SoCalCycling.com Team looked pretty good, with the riders marking each other. Tyler Locke (Centric Bikes) started the final sprint with Wesley Eslick (SoCalCycling.com Team)and Jason Cianfrocca (SoCalCycling.com Team) tucked in the end of the line, so they could start their sprint as the road tilted slightly down hill. Wesley Eslick started to open up his sprint and pulled along Tyler Locke with Jason ready to come off of Wesley’s slipstream to launch his sprint where he tried to let Wesley win as it was his birthday but also making sure the SoCalCycling.com Team would secure the win. 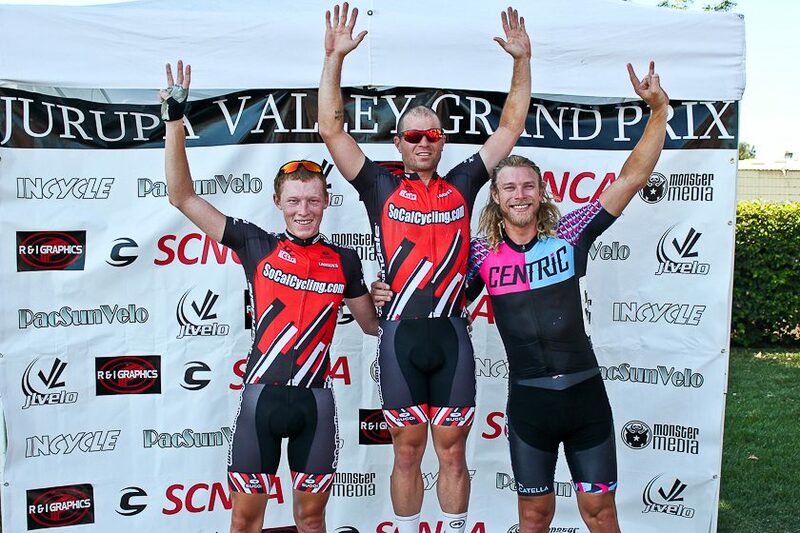 It was close sprint between Tyler and Wesley for second and third, but Jason Cianfrocca won a few weeks earlier on the same course and did a repeat and took the win convincingly. So for myself coming off a serious accident, and making it out to the race it was special to see the Team get first and second. The SoCalCycling.com Team has been super consistent all season long with team almost getting on the podium almost every weekend through out the whole season.